I just realized I haven’t written any more posts about the deployment since our soldier’s homecoming. I thought I would do a little update for anyone curious what life after deployment looks like for us. It’s been nine months since our soldier’s homecoming. It doesn’t feel like he’s been home that long. The deployment is still so fresh in my mind. My husband does very well with adjusting back into civilian life. He has been through two different wars in two different countries. We have not had to deal with PTSD (post-deployment stress disorder) issues that many soldiers and their families must deal with. Now, that is not to say that war did not affect him. There are certain things he is more aware of than the average person and certain noises (especially fireworks) that do bother him. To be completely honest, the last deployment was very hard for me. It was overwhelming. Both my mental and physical health were put on the back burner while I did my best to raise three young children. I am still feeling exhausted. So much attention is put on the soldiers who are deployed, and that is rightly so. They are going through things most of us cannot imagine, but deployment does affect families, too. I developed anxiety while he was away, and I am still battling it. Since my husband came home, we have had one challenge after another. The first came right after the new year. I had a very early miscarriage. I have not blogged about it yet, but it was a difficult experience. Not long after that our dog got hit by a van. He survived with very little damage, but the vet bill was quite expensive. Two months later my husband woke me up saying he was having terrible chest pains. We ended up rushing to the ER with our three children. He was okay, and most likely it was a pulled muscle, but the next day our youngest came down with a horrible stomach virus that dehydrated him and landed him in the hospital. It wasn’t long after that the entire family was sick with this horrible virus. Not long after that my husband found out the job with my father in law’s small business that my he was planning to work at was not going to work out. There’s just not enough profit to keep him paid. So, currently my husband has a temporary job and is applying like crazy for other jobs. He’s even had two interviews and one was very promising. We are just praying something comes through soon. I know things could be much worse. I’m thankful for where we are right now, but I am ready for a break. For some normalcy. For some weight off the shoulders. To be able to save money for a vacation and actually go because Lord knows we need to just get away and have fun rather than take that money to pay bills because the income isn’t coming in anymore. It makes me feel guilty for staying home and homeschooling. My two youngest kids have adjusted well to having Daddy home. My oldest has had a more difficult time. At first he was afraid that every time Daddy left the house he wouldn’t be coming back for a long time. We are also dealing with him not wanting to sleep in his own bed. Not everything has been bad. My husband started taking online classes again and we have gotten out and explored the area where we live some. We are getting more involved in our local homeschool community and will start a co-op in September. Hopefully that means we will meet some new friends! Things are good, but not great. We are happy that at least our family is back together. Stay tuned for some more news that will explain where I’ve been for the past couple of months. This little blog has been neglected! Update: My husband got a permanent job offer! Praise the Lord! We are excited for the next chapter of our lives! So glad I popped over to see your blog! 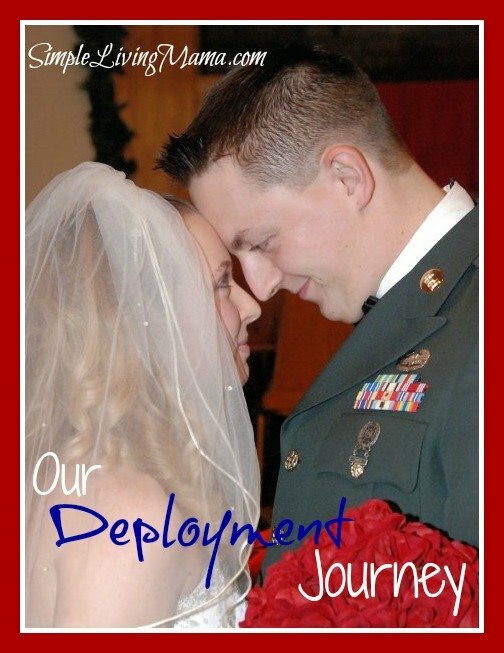 You’re story, not just in the deployment, but military life in general, is so like mine – it’s almost scary! 🙂 It’s very hard when your husband is out of work, and you wish you could do something, although you know where God wants you is right there in the home taking care of and teaching your children! I have been right there in those shoes, and it definitely is a faith-growing time. It is a very hard time for a family when daddy is deployed, and hard on a mama and a wife to keep it together! You are right is showing that just because they get back, doesn’t mean that all of a sudden life is right back where it once was – it never is quite the same. We have more than one child that likes to crawl in bed with us, and the fireworks issue is real – my husband doesn’t like to be taken by surprise by anything that loud. Thank God for pulling us through when we don’t think it’s possible! And I am so glad that he got a job offer 🙂 I hope it all works out wonderfully! 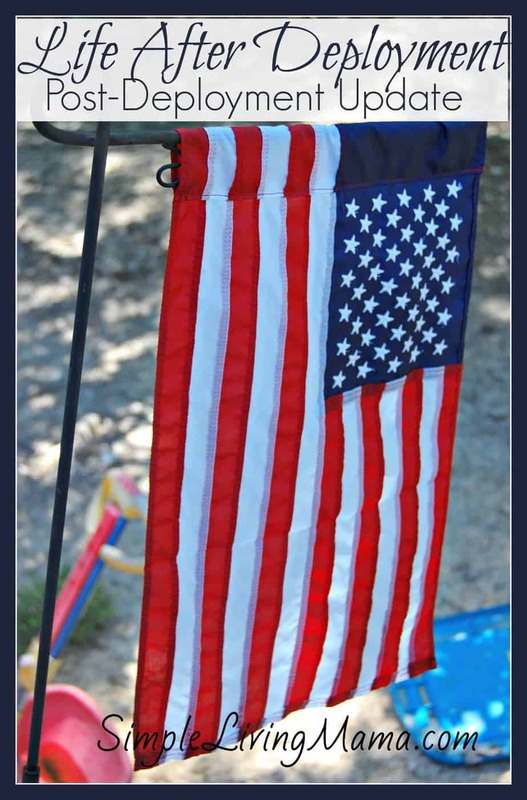 Amy @ No Greater Honors recently posted…Summer Fun!